Do all you can to love everyone. If you are not yet able to, at the very least don’t hate anyone. Yet you won’t even manage this if you have not reached detachment from the things of this world. You must love everyone with all your soul, hoping, however, only in God and honouring him with all your heart. Christ’s friends are not loved by all, they sincerely love all. The friends of this world are not loved by all, but neither do they love all. Christ’s friends persevere in their love right to the end. The friends of this world persevere only so long as they do not find themselves in disagreement over worldly matters…. Whoever has love has God, because God is love. [1 John 4:16]. I found this wonderful bit of wisdom in the reading for today in Thomas Spidlik’s book, Drinking From the Hidden Fountain. 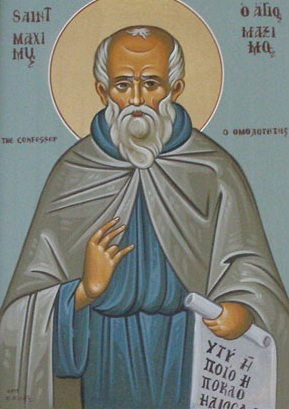 I have previously written about Maximus the Confessor (see here), and won’t repeat that discussion in this post. I have, however, always found Maximus to be a source of great wisdom. Perhaps no part of the Christian life challenges us more than Jesus’ injunction that we are to love all of God’s children. This means loving the clerk in the grocery store who really perturbs me, the fellow in the gym who seems so full of himself, and the horrible gossip at Church. It means loving the people who’ve wounded me, even those who remain unrepentant. The Christian life demands that we love without regard to the question of who deserves our affection, without regard to their kindness, without regard to their history, and without regard to their merit. That’s no small part of what underlies the Parable of the Good Samaritan, and it certainly provides the foundation for Jesus’ teaching: “You have heard that it was said, ‘You shall love your neighbour and hate your enemy.’ But I say to you, Love your enemies and pray for those who persecute you, so that you may be children of your Father in heaven; for he makes his sun rise on the evil and on the good, and sends rain on the righteous and on the unrighteous.” Matt. 5:43-46. Those of us who follow Jesus walk down a difficult path, especially the road of loving our enemies. Too often, I hear people make the Faith sound easier than it is. Following Christ is hard; it is as hard as the nails on the Cross. St. Maximus urges us take the discipline of the Christian life seriously. I need to hear his voice more often.